Don Burke is back with a visit to another Midwestern Amish community, that of West Plains, Missouri (Howell County). 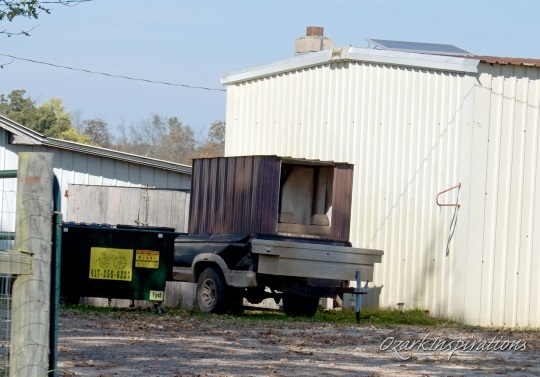 Don discovered several surprising things in this small and relatively young settlement, two of them having to do with the local Amish transportation. I hope you enjoy Don’s account and photos below. 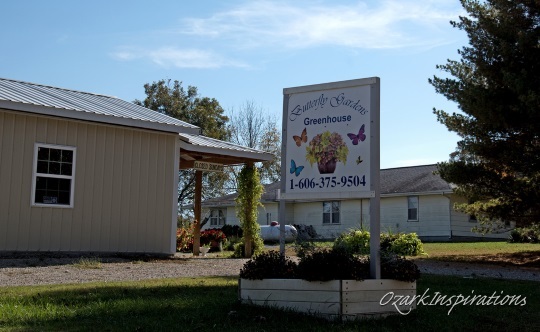 In the autumn of 2016 my wife and I decided to take a couple of days to drive through part of the southern Missouri Ozarks, hoping to enjoy some fall foliage and whatever else we might chance to see. Since our route took us near the Amish community of West Plains, we decided to make a passing visit through there. With the help of a nephew from Mountain Grove, Missouri (approximately 50 miles away), this family built a house, then later bought an 80-head herd of beef cows to raise on their farm. 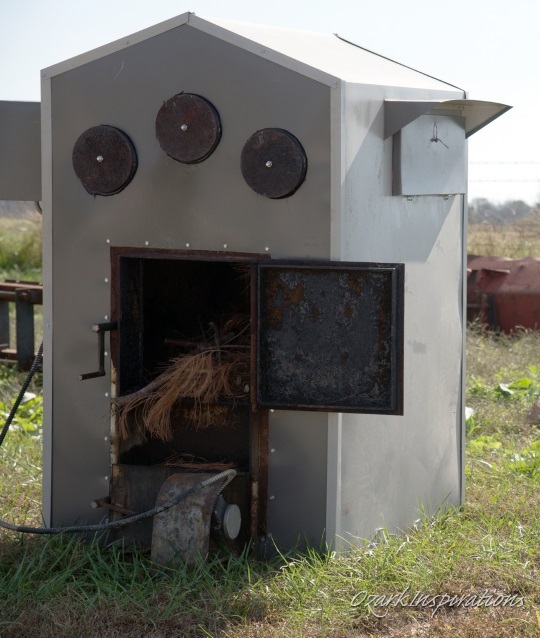 In October their son’s family from Kentucky also moved to West Plains and bought an existing business that made outdoor furnaces. In late winter and spring other Amish families would join them from Wisconsin, Kentucky and other places, making for a total of seven families in the community that first year. During those winter months the Amish in this new settlement went to church in Mountain Grove. In March they were able to have their first Sunday school. 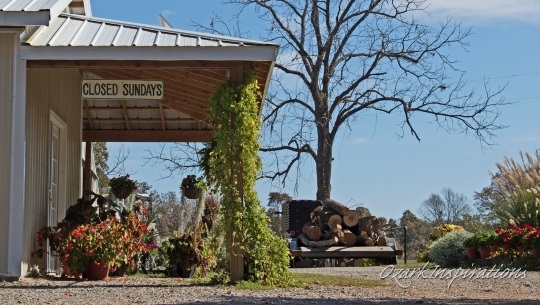 Then in May, along with “a load from Mountain Grove helping out,” the new community was able to have their own first church service. The next year additional families joined them (including another family from Colorado), and a second minister was chosen from within the group. The children were home schooled the first year, but for the next term a basement in one of the homes served as the schoolhouse for the community’s “ten scholars.” Later a proper school building would be set up. 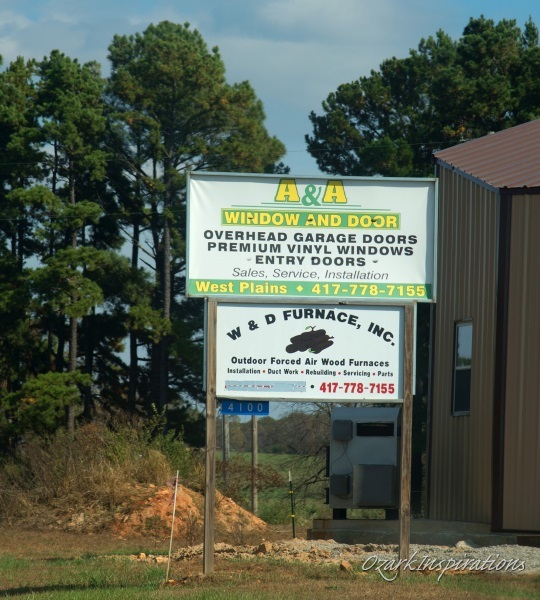 …and the outdoor furnace manufacturer. There are also carpenters and construction workers, welders, horseshoeing, and various types of farmers in the community. 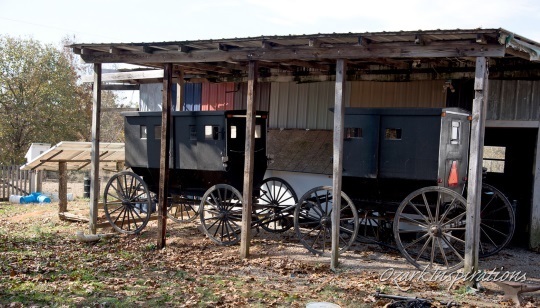 In this small West Plains community I noticed something I don’t recall seeing before – two styles of buggies. At one home I noticed a very common type of buggy design [ed. note: this looks like the Ohio style]. 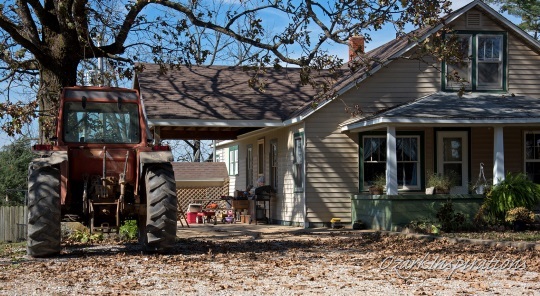 But at a couple of the other homes the design looked much more like the style of buggies like I’ve seen in Indiana. I’m told that typically the local community customs will dictate a single buggy design to be used by everyone in the community, but that is not the case here. Or possibly better stated, it is not yet the case. My guess is that each family brought to this new community the buggy they already owned, and the style differences I noticed are because the one family came from Wisconsin and the other two came from Colorado. I would assume that in time the community will settle on its own standard design and all the new buggies from that point will be made to that standard. 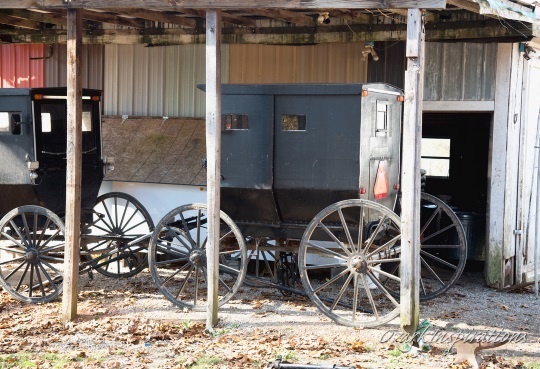 As most Amish enthusiasts know, not all Amish communities are alike, and the level of acceptance of more modern things can vary a lot from place to place. It didn’t take long to see that West Plains is not one of the stricter groups, but is clearly on the progressive side of the spectrum. 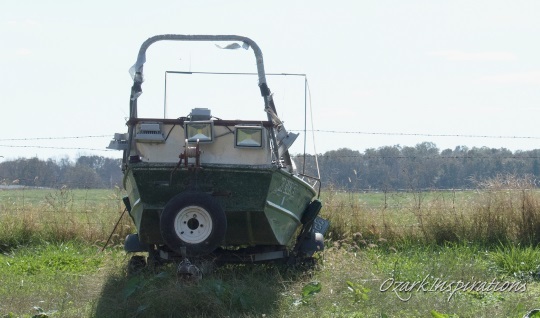 I noticed solar panels, electric lights on the buggies, and even a flat-bottom boat with large LED lights apparently rigged for gigging and/or bow fishing – all which I feel the more strict groups would not tolerate. 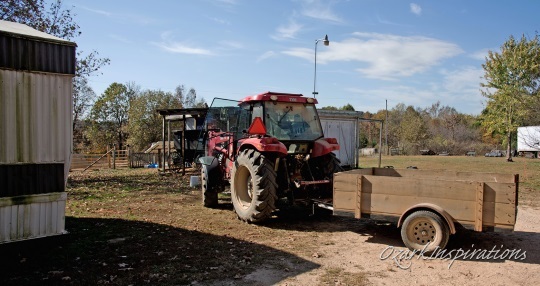 But there was one thing that especially showed how progressive West Plains is – they use tractors! 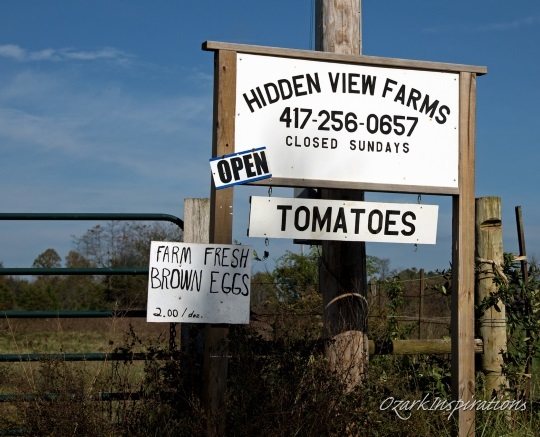 While there are other such tractor-driving communities – such as Garnett (Kansas), some in Holmes Co. (Ohio), and even Mountain Grove (Missouri) – it is still a bit surprising when you see it. 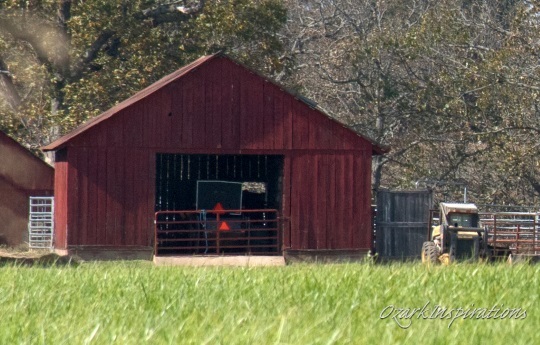 Whether the West Plains Amish use their tractors solely for on-the-farm use or also for routine daily traveling (like those in Garnett and Mountain Grove do), I do not know. Here is a tractor with attached trailer. 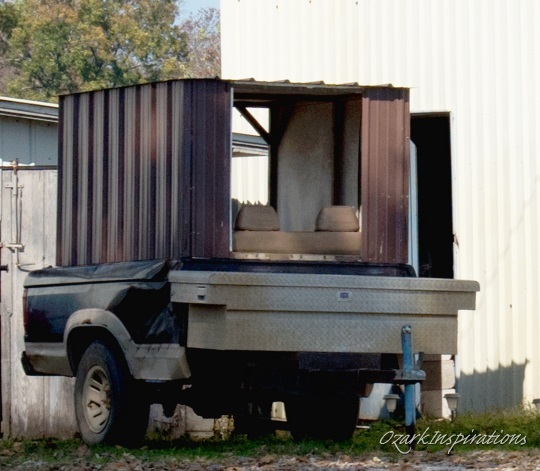 And a pickup truck bed with added sheet metal sides and roof and automobile bench seat – the perfect way to transport your family behind the tractor. 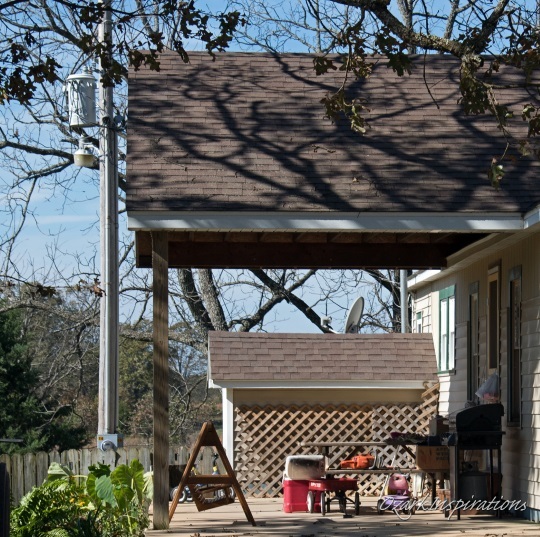 …and power line wires running to the house, transformer, street light, electric meter, and even satellite dish for television. No Old Order Amish community that I am aware of is so progressive that they would accept all this. 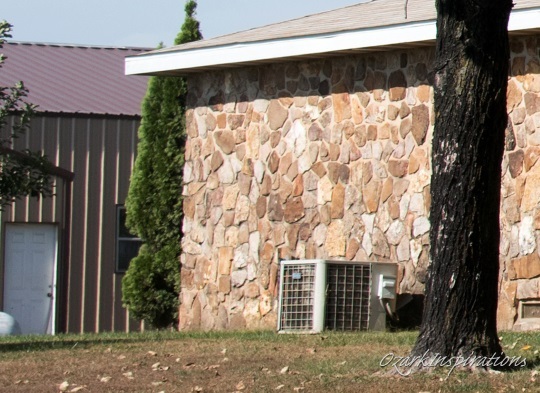 Since some bought existing places and others rented or leased English homes, there would be pre-existing modern features that the Amish wouldn’t use. And in come cases (e.g. for those renting or leasing) they may not even be able to remove them. 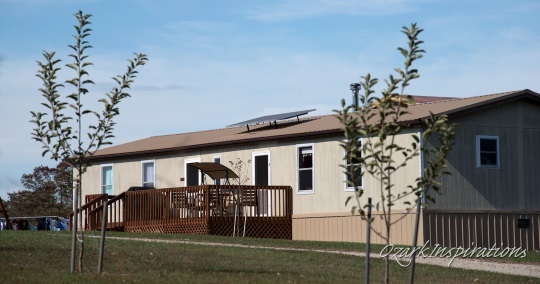 While West Plains was a very short visit for us, it was an insightful visit where we had the rare opportunity to see a fledging community as it continues to establish itself. Thanks to Don for sharing his visit with us. You can check out more of his photos, of Amish, nature, and more on Flickr. My friend and her husband bought a home that had been built and lived in by English. They had the electric etc turned off but they couldn’t remove all the wiring and such. This is very likely the reason here too. It happens sometimes, and sometimes the other way around as well – English renting from the Amish. Also, when Amish buy an English house (ie, electrically-equipped), they may have a period of time before they need to have it converted to an Amish-style home, as that takes some money to do. The way it looks to me with the buggies, they just brought along what they had been using, as a lot of newer communities do. I know that is how Carlton, PA does- my cousin lives there. Eventually they may change a little here or there to have them nearer the same, like changing the curtains, lights, etc. And your explanation for the Satellite dishes, electric wires, street lights, etc. is likely Right on. Even in established communities like where I live, they have a year to change things, if buying a home from English folks. I’m sure in newer ones they might even have more lee-way and most times it makes more sense to buy existing homes, than to build all new ones.Also, if someone’s not too sure if they want to stay with that community or just see if it’s a good fit for them, before making strong commitments like building a house, it makes more sense to rent. As larger communities like Lancaster, Holmes, N.Indiana, and such become more crowded we’ll see more and more of these little mixed communities pop up all over the place. They have their struggles tho’, because all are used to things how they were back home and there needs to be lot of give and take, and being able to give up your ideas for the sake of unity and peace. Thanks Rebecca for the confirmation. I don’t like speculating too much, and it helps for someone to confirm what I’m only guessing at. And also I’d like to thank Erik for once again allowing me to share some of my Amish adventures. Thanks Don. I have always enjoyed your photos and commentary about the various Amish communities you have visited. What an interesting post! It’s very interesting to me to observe the beginnings of a new Amish settlement by folks from different Amish communities in different states. So far, they seem to be adjusting. I hope they thrive. I can’t help but wonder if these somewhat hybrid Amish communities (with more and more English paraphernalia) are truly the future of most Amish life in this country. It’s becoming increasingly difficult to carry on a traditional agrarian lifestyle these days, whether Amish or English. It will be interesting to see what happens as years go by. I certainly wish them well! Thank you, Don, for more of your photos and “Amish Adventures through America.” I always enjoy them! Thanks Alice Mary for your compliments and other thoughts. 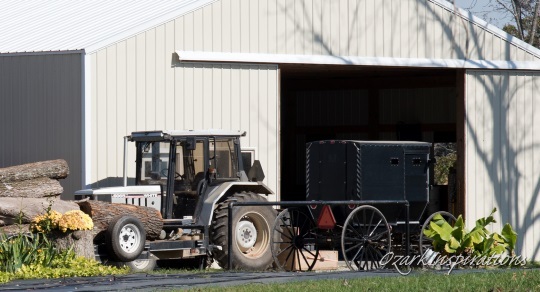 It is an evolving world that we live in, and even the Amish are not untouched by it. Always glad to share. Knowing that others get something out of it makes it all worthwhile. 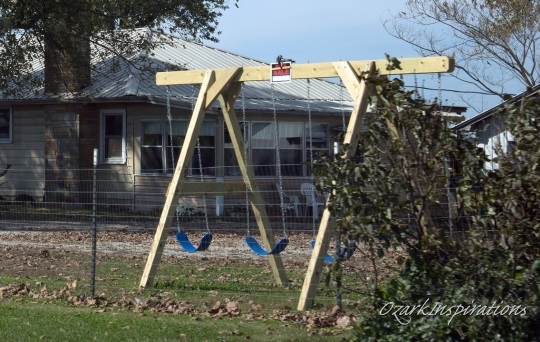 Thank you so much, Don, for you post on West Plains, MO; and the pics, too. It’s always interesting to hear about a new community coming together. The world is certainly changing, and I wouldn’t say it’s always for the better(just my opinion). One way or another everyone is touched by change. I live in West Plains and I can tell you that the Amish here are very different. I have 3 Amish neighbors. They are some of the best people you will ever meet. One owns and runs a Tyson chicken farm. They do drive the tractors for transportation. The ones by my house keep it pretty simple. Plain clothes and only necessities. Wonderful to sit down and talk to. However we have Amish here that wear bright clothing. One of the houses shown above has a swimming pool and a volleyball net set up in the back. That same house has a ski jet and trailer they pull behind the tractor to the lake. So I guess it just depends on what part of West Plains your talking about. Thanks for sharing April, it’s neat to get a comment from someone from the area. And great to have good neighbors, isn’t it. Thanks April for the confirmation and insights. It’s always good to get someone “in the know” to help me be sure of my speculations. I’m curious (if you know), the Amish family that has the swimming pool — where did they move from? Don we almost always had a swimming pool growing up… we didn’t have a pond to swim in so a pool was our way of cooling off on the hot summer days! Yes they do use the tractors for transport. They are very nice people. My grandma is neighbors with some outside of town off JJ. Very different than the ones who live up here in licking and mountain grove. We are actually selling hay to a family out of licking and they use telephones. We see them at the Salem livestock barn a lot too. They are very patient and polite people. The kids are also allowed to speak to strangers as well up here which I found intriguing. Thank you Pauline for your kind words. And my condolences on the loss of your husband. Holmes Co. is a favorite location for me and my wife, too. We’ve made four visits there, and we just love it. I don’t know if it will help you relive your previous trip there, but you are welcome to visit my website where I have several albums with pictures from Holmes Co. 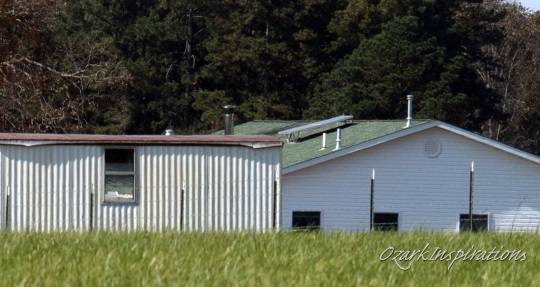 The link below will take you to all my Amish pictures, and about half-way down the page you’ll see a link marked Holmes Co. Click on that, then click on any of the several albums you’ll see next, and in each album will be several pictures I hope you’ll enjoy. Thanks to everyone for your compliments. It’s a joy to be able to share my visits with you. Thank you for sharing this. Was very interesting to read and I did enjoy seeing all the pictures. Thank you for sharing this. It was very interesting to read. I alos enjoyed seeing all the pictures. Jamesport, MO is having one of their annual school auctions this Saturday May 5 2018 at the Jamesport Produce auction building. They will have over 100 quilts plus all sorts of other things. Mary thanks for this info – is there anything posted online about it that you could direct me to? Not that I know. Our Amish friends at Jamesport just told us. These people probably bought English homes and never removed the wires or dishes. That is not out of the ordinary, except for maybe their dishes not being removed. They could also be a new type of community. A mix match of various Amish who adopt to a new set of community regulations. That’s not out of the ordinary either. Kalona, IA and the less strict community in Maine are examples of that. Since the Amish people are growing and spreading, the likelihood of some divergence is normal. Some communities become even stricter and some news ones become more liberal. Sorry for my grammar. Using my phone and not spell checking. No problem Aj. Since you noted it I hope you don’t mind I took the liberty of patching up your comment by adding a few missing letters, so should be typo-free unless I missed something. Wasn’t too bad 🙂 And thanks for the comment itself, good points. Imagine my pleasant shock to see my hometown area (Howell Co) featured. I’m so interested and impressed with what has been shared. I look forward to more such features from Mr Burke. Erik, what are the chances of Amish adults moving back to an area that they may have lived during their childhoods? Just curious as I am so hoping that maybe some of these people are the same people, children or grandchildren of the 3 young Amish girls I knew in elementary school. Carolyn, neat to hear that. As to your question, well I’d say it is certainly possible, and especially if they are still in the same affiliation as their original community. You may have some old friends or friends-of-friends living here as adults. Erik, received your email re: comment hidden in spam. It is probably because I have not been on AmishAmerica very often in the last couple years. Thanks so much for monitoring the posts so well and giving feedback quickly. Sure thing Carolyn! Just wanted to make sure you knew it didn’t disappear. Occasionally comments disappear into spam for no discernible reason, but I monitor it and pull them out if that happens. Glad you took the time to share. Erik, could the spam problem be related to another email problem I just discovered? When I clicked my inbox to see your latest reply, there was no link for me to click back to this page even though the instructions to click such and such address were printed as part of the email. The only way I got back here was to click on another blog post in my inbox then do a search on West Plains to find this column. Interesting Carolyn, would you mind forwarding that message to me so I can see what’s going on? It is ewesner(at)gmail.com . Thanks! Living in West Plains, the Amish I have seen are definitely not traditional. They use tractors for transportation that use off road fuel that is not taxed. Their children are not required to be in carseat’s. Just this persons option that if they are going to use the roads in non traditional Amish modes of transportation they should abide by the same laws.